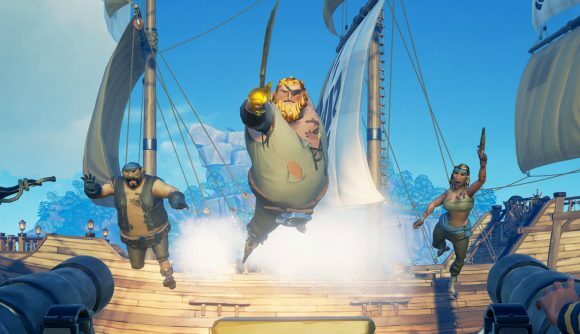 Sea of Thieves has had cross-play between Xbox One and PC players from the start, but putting mouse and keyboard users against controller users in a single pool has always been a controversial thing. Now, Rare is giving console players the option to opt out of competing against those with more precise aiming tools. The general cross-play pool will still be open, but Xbox One players using controllers will be able to opt out into a separate pool just for them. As Xbox One gets mouse and keyboard support, so will Sea of Thieves on the console. Those players will automatically be in cross-play, as will PC players making use of a controller for couch gaming. PvP in Sea of Thieves is largely optional, but the core of the game is about player interactions that can escalate in varied ways to friendship, betrayal, or violence – a gun’s gotta come out at some point or another. The game will soon get a more directly competitive PvP Arena mode soon – the cross-play option is set to hit sometime before that new game type is active. Sea of Thieves’ sudden Twitch success has brought a lot of new players and new playstyles to the game, including much more competitive ones. The latest developer update video addresses that, including some combat improvements set to launch next week. Most notably, there’s going to be an effort to knock down the effectiveness of double gun strategies and a focus on making melee more effective. The first part of these combat changes will hit in the February 6 update, but more will be coming in the future. More details on all that will happen in next week’s developer update. You’ll also see some more Sea of Thieves on next week’s Inside Xbox stream, where the developers will discuss some of the broader plans for what’s coming to the game in the new year.